Katherine is a specialist family barrister, who maintains a diverse practice spanning children and finance work. Katherine is qualified to accept instructions under the Direct Public Access Scheme. Katherine has broad experience acting for local authorities, parents and children, including in the areas of non-accidental injuries, substance misuse, domestic violence, and international placements. She has particular experience dealing with disputes involving international jurisdictional issues. Katherine’s experience and commitment to representing local authorities, parents, and children places her in an excellent position to anticipate arguments from all perspectives and to achieve the best possible result for her client. Katherine has experience across all areas, including lengthy private law Fact-Finding hearings. Her practice covers child arrangement disputes, internal and external relocation, Family Law Act applications (including forced marriage), and FGM Protection Orders. 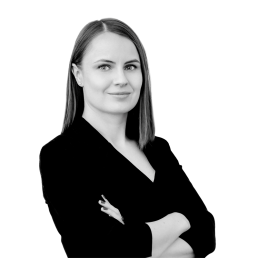 Katherine has particular experience with applications under the Hague Convention concerning child abduction. Before coming to the bar, she worked as the legal assistant to the head of the family department at a prominent solicitors’ firm in London, specialising in international child abduction. Disputes between cohabitants concerning property (Trusts of Land and Appointments of Trustees Act 1995). I am registered with the Information Commissioner’s Office (ICO) as a Data Controller for the personal data that I hold and process as a barrister. My registered address is New Court Chambers, Temple, London EC4Y 9BE and my registration number is ZA110235. I store my case files on Microsoft Onedrive which is a cloud hosted environment based in the US. Microsoft Onedrive relies upon a variety of legal mechanisms for its international transfer of personal data from the EU to the United States. Microsoft Onedrive is certified under the EU-US and Swiss US Privacy Shield Programs regarding the collection, use and retention of personal data and its transfer from the EU and Switzerland to the United States. In addition to the Privacy Shield, Microsoft Onedrive also provides strong contractual guarantees around the privacy of its services and relies on the EU Model Contract Clauses to cover its international transfers of data. There are overriding legitimate business interests, including but not limited to, fraud prevention, the need to retain certain documents for the duration of the limitation period for any professional negligence claim, and protecting customers’ safety and security. The General Data Protection Regulation gives you specific rights around your personal data. For example, you have to be informed about the information I hold and what I use it for, you can ask for a copy of the personal information I hold about you (however, I do not have to grant subject access in respect of personal data if a regulatory exemption applies), you can ask me to correct any inaccuracies with the personal data I hold, you can ask me to stop sending you direct mail, or emails, or in some circumstances ask me to stop processing your details. Finally, if I do something irregular or improper with your personal data you can seek compensation for any distress you are caused or loss you have incurred. You can find out more information from the ICO’s website http://ico.org.uk/for_the_public/personal_information and this is the organisation that you can complain to if you are unhappy with how I dealt with you. You may request access to, correction of, or a copy of your information by contacting me at kcouper@newcourtchambers.com.